As fans get ready for the premiere of The Perfectionists — the Pretty Little Liars sequel that begins on March 20 — we’re still left with a few questions about how the show will incorporate characters from its popular predecessor. Back in 2017, it was announced that PLL stars Sasha Pieterse (Alison DiLaurentis) and Janel Parrish (Mona Vanderwaal) would reprise their roles in the spinoff, leading viewers to wonder if fellow alum, Shay Mitchell (Emily Fields), is also scheduled to appear. The long-running Freeform series ended with Shay and Sasha’s characters getting engaged and raising twin daughters, Lily and Grace, so naturally, devotees of the show want to know why Emily isn’t a part of The Perfectionists. 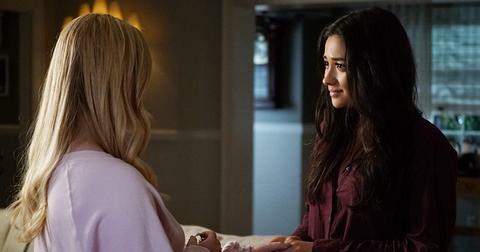 Here’s what we can tell you about the Alison/Emily storyline ahead of the teen drama’s debut. Where is Emily on The Perfectionists? According to showrunner I. Marlene King, The Perfectionists will not erase Alison and Emily’s history. 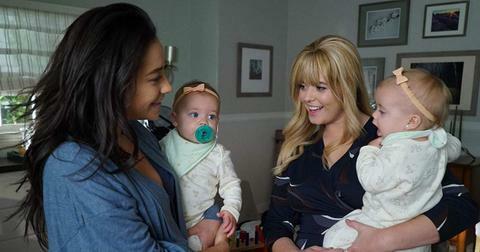 "Emily and the babies are safe in Rosewood," the producer told TV Guide. "Alison comes to Beacon Heights because an opportunity arises that she can't pass up. It's very hard for her to leave Emily and the babies, but we will understand as the first 10 episodes play out what's happened in that relationship, why it's happening, and why Alison is so far away from Emily." In a separate interview with the magazine, Sasha echoed a similar sentiment. "Alison and Emily will always love each other. They have these two beautiful babies together. It's complicated. Life is complicated, and I think piecing themselves and each other and their world back together since 'A' happened is difficult," she shared. Whether or not Shay will make an appearance remains to be seen, but she isn’t currently listed as a cast member for any of the show’s first 10 episodes. Are Emily and Alison still together in The Perfectionists? 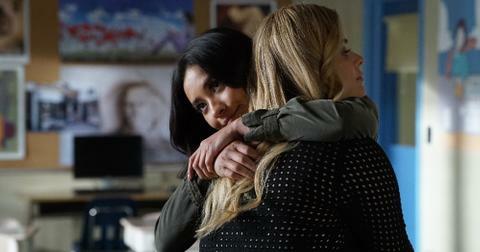 Based on Marlene and Sasha’s quotes, we’d guess the duo isn’t a couple at the moment, but that Emily is still a big part of Alison’s life. We’re still not even sure what Alison is doing in the world of The Perfectionists. According to a press release from Freeform, the show focuses on a group of three college students, played by Sofia Carson, Sydney Park, and Eli Brown. "Everything about the town of Beacon Heights seems perfect, from their top-tier college to their overachieving residents, but nothing in Beacon Heights is as it appears to be," a description from the network reads. "The stress of needing to be perfect leads to the town’s first murder. Behind every Perfectionist is a secret, a lie and a needed alibi." The murder mystery is based on a novel by author Sara Shepard, who also penned PLL’s source material. Sasha previously revealed that The Perfectionists has nothing to do with the PLL universe and that her character has simply been dropped into it. Given Alison and Mona’s penchant for drama, we’d say the residents of Beacon Heights have a difficult — and dangerous — road ahead of them. Tune in to the premiere of Freeform’s Pretty Little Liars: The Perfectionists on March 20.